I must be Australia's least successful game show contestant. Four shows and nothing to show for it. It's hurting my fingers to type this but, as a Sydneysider and someone who has travelled a lot, it pains me to confess that I harbour a secret love for Melbourne - one of the most happening cities in the world. Melbourne gets better every time I visit. Formerly derelict city laneways are revived; another huge, sparkling sporting venue opens; new bars and major public artworks pop up in the most unlikely places; and some wunderkind chef has (again) reinvented Australian cuisine. I don't pretend it's perfect. I'm sure it has a heap of issues. It's just that, as a visitor, it seems so...self-assured. You can tell the locals are quietly proud of their city. They all seem to be out exploring it in detail, enjoying it almost as tourists do. I never need much of an excuse to visit Melbourne. So when a mate called up and said, "Buddy, I need you to pop down and go on Deal or No Deal with me", I was there in a flash, equally excited about revisiting the southern city, and the prospect of winning oodles of cash on a game show that rates through the roof. 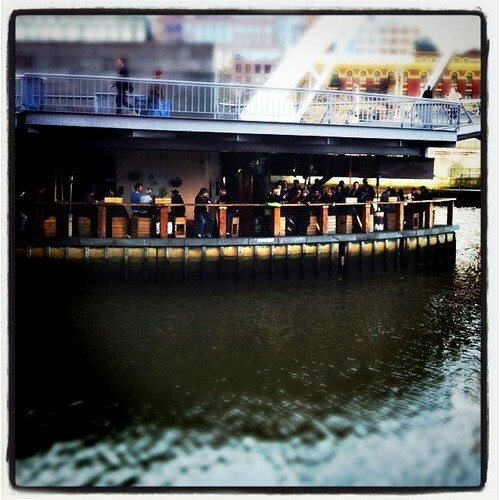 Ponyfish Island, a pop-up island bar on the Yarra. So it was that we made our way to the near-mythical Deal-O-Drome, pumped for a day of excitement and riches. And for one brief, shining moment I thought we were about to have our moment in the game show sun. The voice-over man had just announced that our section of the audience had been chosen to play. I actually felt giddy. The boom camera swung towards us then slid past purposefully and came to rest in front of another contestant. Understandably, he went crazy knowing he was about to step into the spotlight to play for some big money. The rest of us clung to a veneer of contrived enthusiasm as our dreams were dashed on the Deal or No Deal rocks. Even though the game show gods did not smile on us that day, it was still a cracker. We laughed for hours, yelled preposterous advice to contestants risking huge amounts of money, I even got to dance in front of The Dealettes and broke a part of their set - an incident that stopped the taping for 25 minutes while four tradesmen worked to repair it. The Dealettes await a close-encounter with the author. When all the deals of the day were done, we had enough time to walk empty-handed from the Deal-O-Drome to the centre of town. Tram bells ding-dinged determinedly as they trundled down St Kilda Road in the winter sun towards the sullen National Gallery and sprightly Federation Square. Football fans bedecked in team regalia headed off through long shadows to one of the city's sporting colosseums, while the Suits congregated in bars beside (and in the middle of) the Yarra River before, no doubt, heading off to the same footy game. The small joys of that short walk washed away any lingering Deal-O-Drome disappointment. And having so much game show moolah slip through my fingers? After a cheeky taste of one of my favourite cities, it seemed like no big deal at all. 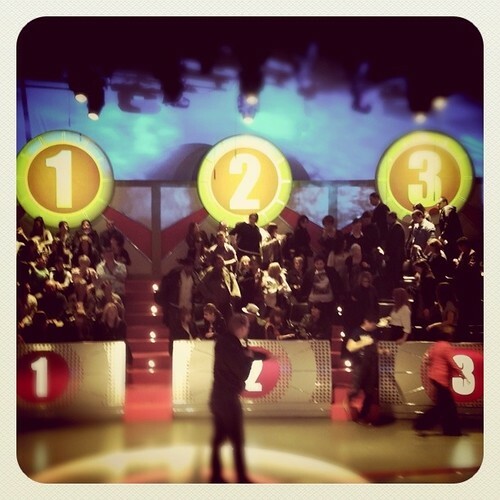 Oh gameshows and their ridiculous sets and plot lines! Too bad you didn't win anything, but it sounds like you got more out of the deal with a visit to Melbourne. I love the photo of Ponyfish Island! Gems like Ponyfish Island pop up regularly all over Melbourne. They add to the constant sense of renewal and reinvention that drive the city's pulse. Well worth a visit if you're ever in this neck of the woods. Thanks so much for the feedback, Mahesh. Will do my best to keep it up.